Over the past couple of years, the binary options trading industry has been focusing their eyes firmly on brokers that are regulated. As such, binary brokers who are regulated by the Cyprus Securities Exchange Commission (CYSEC) and the Malta Financial Services Authority (MFSA) are held in high regard to the fact these brokers hold the “paper qualification” to operate legally within the Eurozone. As seen by the recent suspension of WGM Services Ltd’s CIF license by the CYSEC in late November 2014, having a piece of paper issued by a regulatory body is no guarantee that a broker will remain operating indefinitely. This is why in this review we have decided to focus on ZoomTrader, a binary options broker who has been around for a few years and has now been regulated by CySEC (224/14) in January 2015. The differences between ZoomTrader and other leading binary brokers don’t just extend to how these brokers render their services to their clients. There are also major differences between the type of trading platforms adopted by these brokers and ZoomTrader. While most brokers have chosen to adopt the SpotOption powered trading platform as their trading platform, ZoomTrader have instead opted to use the Tradologic powered platform. While the Tradologic powered platform might not be as fancy as the SpotOption platform, it does have its own plus points. For example, the platform allows traders to decide what format they want their trading screen in. There is a choice of 3 different formats namely, “Classic View”, “Multi View” and “Chart View”. Traders also have the options to decide their return and risk ratio for every single trade. Previously, this feature was only limited to a certain type of trading contract called “Option Builder”. However on ZoomTrader, there is no such limitation. Finally, ZoomTrader’s trading platform also comes with a couple of useful risk management tools call “Close Now” and “Extend Now”. These tools are used for closing a position before its expiration time and for extending the expiry time of an option respectively. In terms of the payouts offered by ZoomTrader, the returns are quite reasonable and capped at a maximum of 83% for normal trades. An interesting thing about ZoomTrader’s payout ratios is the fact that traders have the ability to decide between 5 different levels of returns and risks which they want to undertake for each trade. The lowest return is at 60% with a rebate of 20% for failed trades. The highest return is usually pegged at 80% with no rebates. 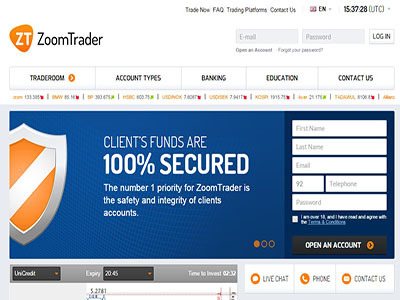 As for trading accounts at ZoomTrader, they have given traders a choice of 4 different types of trading accounts. Beginners can start with the Bronze account and gradually work their way up to Silver and Gold trading accounts. For those who are interested in trading in volume, they are recommended to open a Platinum trading account as this type of account is more suitable to those who are dealing with larger amounts. Since beginning their operations in 2012, ZoomTrader has proven to be a very reliable broker and maintain a high standard in the quality of the services that they offered. We can see this from the fact that they are always ready to assist traders 24 hours a day 7 days a week. To make the task of communicating with the support team easier, they have provided traders with several communication channels such as email, live chat and the telephone to contact them. Miscommunications between the support team and traders are kept to a minimum with the availability of multi-lingual support in several major Asian and European languages. While we won’t go as far as saying that ZoomTrader is the best binary broker around, we cannot deny the fact that they have managed to endear themselves to a large following of loyal traders. This is because ZoomTrader goes all the out the way out to make their traders feel appreciated rather than blindsiding them with gimmickries such as so called “technical Innovations” and the fact they are “regulated” entity like what most brokers are doing nowadays.